Mate! New Zealand has world class ski touring. This tour is designed for those who want to ski it all - this is the ultimate 12 day South Island Kiwi ski touring adventure! This is a circuit that takes in the best skiing the Southern Alps has to offer. Beginning in Wanaka we meet the locals first as we head backcountry from the Treble Cone skifield for an introductory day. Then it's off to the wild West Coast where we fly to the top of the incomparable Fox and Franz Josef Glaciers. The views from the surrounding high peaks down to the Tasman Sea are spectacular. Moving north to Canterbury experience one of our unique & friendly club ski-fields before flying in to the famous Murchison and Tasman Glaciers. This is glacier touring at its best and the views of Mt Cook are unforgettable. On to the picturesque Lake Ohau and the backcountry terrain at its doorstep before finally returning back to Wanaka. Every step of the way our local knowlege will treat you to New Zealand's best kept ski touring secrets and we do all the hard work for you ! The Southern Alps rise up out of the Tasman Sea like an enormous spine of snow and ice. Larger than the alps of France, Switzerland and Italy combined, the remote and inaccessible nature of New Zealand's mountains means that ski touring is not as straightforward as it is in other countries. While there are massive areas of glacier there is no "high route" that links up for more than a day or two of skiing since you soon reach impassable terrain. 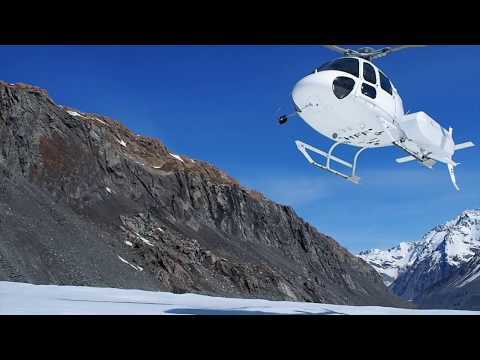 The Ultimate NZ Ski Safari links up the best terrain on the South Island by using everything from fixed wing planes, helicopters and ski lifts to good old leg power. Our local guide will show you our favorite spots, from powder stashes to fun and funky Kiwi hotels. Let us introduce you to New Zealand's Club Fields where the friendly on field accommodation and insane rope tows launch you into incredible ski touring terrain. Participants will need to have previous experience ski touring and strong downhill skiing experience is essential. You don't need to be an expert skier but you should be experienced with dealing with poor snow conditions such as breakable crust or deep soft snow. Skiers need to be confident side slipping down 40 degree hard snow. Minimal crampon and ice axe skills are required, participants should have some basic familarity with walking in crampons and using an ice axe but there are only short sections where these are required. This is not a technical mountaineering trip. Clients are responsible for paying for their own food when they are not in mountain huts. Welcome to Wanaka. Meeting with guide at Aspiring Guides offices with gear check and itinerary discussion. This is a chance to purchase last minute items and make final decisions as to what gear you need. Day 12. After a night a beautiful Ohau Lodge we can use the chairlift at Ohau Ski Area to give us a jump into the backcountry. This is big country and a drop down to Lake Dumbell with a tour back to the access road will leave you with your ski touring itch completely scratched before over Lindis Pass and back to Wanaka.